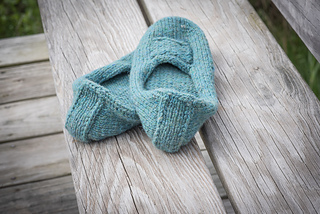 Quick, small, and lightweight, these pretty slippers are the perfect thing to throw in your bag for a weekend away, and a great project for that skein of farm yarn that you just could not resist. The slippers are worked in one piece from the toe to the heel, with a bit of short row shaping to keep them on your feet. You then work around the edge, with the cable panel worked during the edging. Three stitches to graft, two ends to weave in, and you’re done! The toe is worked in the round; the rest of the slipper is worked flat, with the cable panel both written and charted. 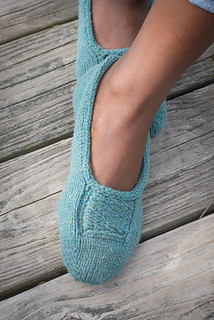 The pattern includes tips for selecting your yarn, plus illustrated tutorials for the toe-up cast on used in the sample and for working German Short Rows. For a good fit, take time to check your gauge. Harrisville Highland is a fairly springy, durable, woolen-spun, 2-ply worsted weight yarn. I chose this yarn for the sample because it’s hard wearing, has good memory, is fairly inexpensive, and comes in a wide range of beautiful colours. The woolen-spun structure gives a light, cushy, cohesive fabric for a comfortable surface under your feet. Though the yarn starts out a bit crunchy, it softens with washing and wear. If you’re substituting another yarn for this project, look for a wool or wool blend with good memory that feels comfortable on your feet and gives a solid fabric at the pattern’s gauge. Merino and superwash merino will work, just be aware that the finer fibres won’t stand up to wear as well as stronger wools.